The clients wanted something a little different for their new kitchen so the idea was to create a beautiful curved island as the main focal point of the room. The main run of the kitchen was to be on the back wall near the island with cleverly built-in storage under the staircase. They wanted lots of storage, a work space and a dining area. 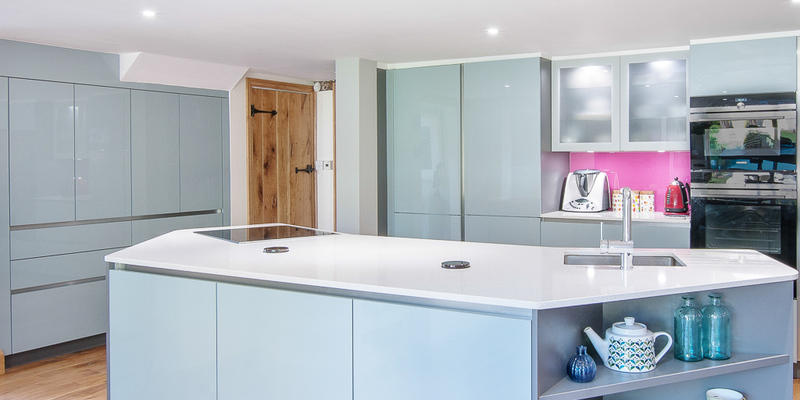 They liked the idea of a high gloss door combined with light quartz worktops and as is often the case, they wanted all the appliances to be integrated into the kitchen. The idea was to build a curved island in the middle of the kitchen which would be the cooking and preparation area with lots of storage built into the stair well area and the surrounding walls. Our clients also wanted some open shelving and a work space. All of the appliances were integrated into the kitchen with a pull-out larder, full height freezer, full height fridge, dishwasher, Siemens oven and combi-microwave, pull out bins and recycling bins. One of the key elements was the units built into the stairs, the designers and fitters did a great job of maximising the storage space as well as making sure the frame and doors fitted perfectly. 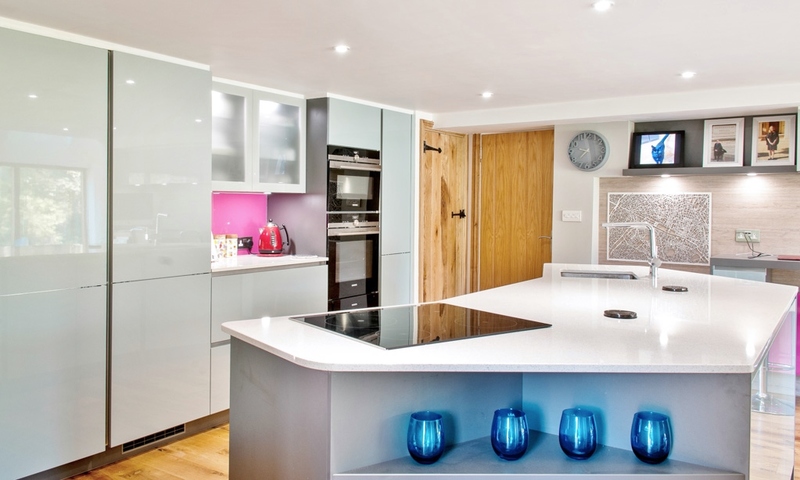 Curves can be tricky with kitchens and this had to be well designed and planned, the challenge with curves is how to integrate them into a space that is primarily made up of straight lines. The overall effect is a unique kitchen which is both practical and creative. 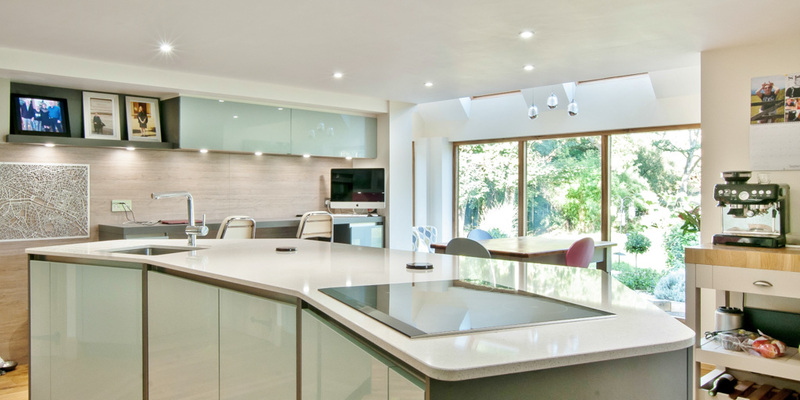 The kitchen is spacious, well equipped and the curved island is perfect for cooking and entertaining. The clever storage and fully integrated appliances ensure there is no compromise when it comes to functionality. The handleless detail on the doors, the metallic finish on the units mixed with the beautiful white Mont Blanc snow worktops make this kitchen as fun as it is unique. 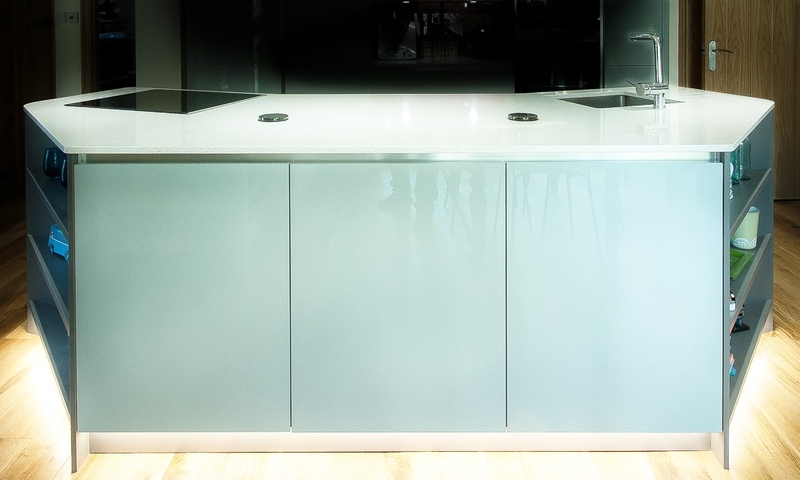 At black Rok we do our best to design and install the very best quality German made kitchens, making sure that all our clients’ ideas, designs and needs are thought of and respected at all times. It is great to work with clients who have the vision to do something a little different and unique.